While flea and tick products are very effective at getting rid of pests that hang out on your cats and dogs, they can also be dangerous. Many of them contain harsh chemicals that can cause allergic reactions and other health problems, especially if you are not using them correctly. We want to show you a few of the best ways to apply and use flea and tick products on your pets in a safe way. You can treat the fleas and minimize the danger to your pets, but you have to know what you are doing. This guide should help you do that. There are some flea and tick products that you can use on either dogs or cats, and some of the best ones recommended by AZCat.net are safe for both animals. However, there are many that should only be used on either cats or dogs. You don’t want to assume that they are safe to use on the other kind of animal, and it is best to only use them on the animals they are made for. That’s because something that is made for a dog may be too powerful for a cat, and medicine made for cats may not work on dogs or may cause them to react in an unpleasant way. It’s very important that you use the right treatment method for each animal and don’t assume anything about the medication that is not expressly written on the packaging. Not all flea medications are the same, nor do they all need to be administered in the same way. Some of them will need to be administered once per day, while others will need to be used far less often. Once again, don’t just assume that they all function the same way or produce the same results. If you try to use some flea medication in the same manner as another medication, then you can end up with a sick animal or a treatment that just doesn’t work. Take time to read the instructions, and if you don’t understand them, then consult with your veterinarian to ensure that you are using the medication properly. Not following directions can mean that your pet won’t receive effective medication or that it will have an unexpected reaction to the medicine. There is nothing more important to your pet’s safety when it comes to flea medication than to follow the medication’s directions. The manufacturers know best how to use their product, and you don’t want to skip steps or assume that you already know how the medication needs to be used. Even if you have used it before, pay close attention to the instructions, as they may have changed since the last time you bought the product. You need to do more than just medicate your pets when it comes to getting rid of fleas and ticks. Your pet’s surroundings may have pests hiding out in it, and Kitten advice stresses the importance of this step in treating for fleas. After you have administered the medication to your pet, be sure to spray for pests and clean up their eggs and dead bodies. You can vacuum and sweep the house, if you have an inside pet, and clean out their bedding area if they sleep outside. Pay special attention to your pet’s litter box and favorite hangout spots, as that’s where you are most likely to find fleas and ticks. If you don’t do this step and clean up the environment along with your pet, then the pests are just going to come back. That means that you are going to have to treat your pet again and again for fleas and ticks, and that can be harmful to its health, not to mention unpleasant. Be safe in treating your pet and treat the environment as well. Don’t wait until the flea problem becomes so bad that your pet’s health is in danger. As soon as you see signs of bites or itching in your pet, consider treatment. Of course, you don’t want to jump the gun and treat your pet when there is no problem, but you should be looking out for indications that there is a pest problem, especially during the summer months. That is when the pests are out in force and more likely to attack your pet. You can practice prevention and keep pests at bay before they ever attack, especially if you know when fleas and ticks are most likely to attack your pet. That can save your cat or dog from experiencing flea and tick bites at all. You simply do not want to wait until everyone can see that your pet has fleas or ticks. By that point, your pet will be scratching up a storm and be incredibly uncomfortable. It may even have open sores that can become infected, and you want to do everything you can to prevent that from happening. The sooner you treat an infestation, the less likely your pet is to have a serious health problem stemming from it. You need to know what signs to look for that indicate a flea infestation in your pet. You should pay attention to any scratches near the pet’s face, extra hairballs your cats may produce, irritated skin on the pet’s back, tapeworms in the pet’s feces, hair loss (due to all the extra itching), and bumps or crusty patches along the back or nape. Your pet may have one, some or all of the symptoms, and any one of them can be an indication that there are fleas bothering your pet. Ticks are a bit more obvious, as you can usually see them on your pet, and they become large and bloated with blood the once they feed. Before they start feeding, ticks tend to look flat and thin, but once they feed on your pet, they will be easy to see. You can simply pull them off with your hands or with tweezers, but you still need to treat for future pests and possibly treat the bite area for infection. Just as you can’t use the same medication in cats and dogs many times, you also can’t use the same medication for young pets and older ones. Adult pets can handle stronger chemicals, but kittens and puppies may have an adverse reaction to them. There is flea and tick medication specially formulated for young pets, and that’s what you should be using if you want to deal with an infestation on them. This applies to pets that are very small as well, even if they are adults. Small breeds of cats and dogs may need special medication that isn’t made for adult animals, even if they are adults. The same dosage that would be okay for a larger animal may be too much for their small bodies to handle, and you need to use appropriate dosage. You can consult with your veterinarian to find out what would be suitable for your pet. Any pets that are less than a year old, are a small breed or have health problems should all be treated with extra special care when it comes to flea and tick medications. These medications are made to get rid of small pests, and the dosage for them can be enough to harm a small or unhealthy animal, so take extra precautions. Don’t risk the health of your pet just because buying new medication or changing the dosage can be an inconvenience. It’s an even bigger inconvenience to have to deal with a sick pet that needs medical treatment after getting too much flea medication. If the first treatment you try for your pet to get rid of their fleas does not work, then you should keep trying other products until you find something that does. There are lots of different brands and types of flea medications you can use. Many of them use different chemicals and offer varied solutions, and you can find one that works well for your pet and that treats them in a safe manner. If flea shampoo doesn’t do the trick, then perhaps a flea collar will. If none of those are effective, you may want to try an oral medication. If your pet will not take the oral medication or has a bad reaction to it, then you can try a spray or gel application. There is a way to safely and effectively get rid of the fleas, and you may not find it on your first attempt. If you are having trouble getting rid of the fleas or finding something that is safe for your pet to use, then you should talk to your veterinarian. You can usually get some good recommendations from the vet, and your pet will appreciate not having to go through the long process of trying one product after another. In fact, talking to your vet is a good place to start. Many veterinarians will give free advice over the phone as to what medication will work for your pet, and that can be far more reliable than searching online or just reading the instructions listed on product packaging. You want to take safety precautions with your fur babies, but you also want to find a way to get rid of the fleas once and for all. That means that you don’t give up and you keep trying until you find something that is effective. If you have more than one pet you are treating for fleas at a time, then you want to keep them apart as you medicate them. This applies to shampoo and spray applications primarily, and as the medication dries, the pets may try to groom one another. They can swallow each other’s chemicals, which can be incredibly harmful for them. So, do what you can to keep them separate from one another. If they are indoor pets, you can keep them in separate rooms of the house until the medication dries. This should only take about an hour or less, but you should do a touch test just to be sure that the medication has dried. You will want to wash your hands afterward. If you have outside pets, then you can simply chain them both up, if they are dogs. Chain them in separate locations to keep them apart from one another. For outdoor cats, you can confine them to pet carriers or some other place that keeps them contained but comfortable. If your pets do groom each other and end up ingesting some of the chemicals, then you need to deal with that right away. Give them something to drink to dilute the chemicals and consult your veterinarian, if possible. You should also read the instructions on the medication’s packaging to see what the manufacturers recommend in this situation. Most medications will provide warnings and instructions for how to deal with ingestion. Those are the best ways to keep your pets safe while you are treating them for fleas. You can get rid of those pests and keep your pets safe at the same time, but you need to apply these tips and be careful with what medications you use and how you use them. Once you do that, your pet can be flea free and so much happier and healthier. 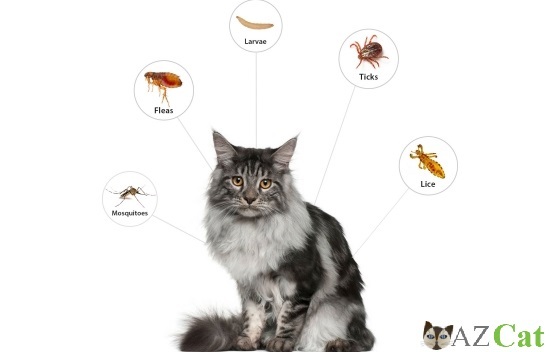 Once the fleas are gone, then the bites, the itching and the sores will go away as well, and your cat or dog will return to its old habits and character instead of being irritated and uncomfortable. Do the right thing for your pets and treat for fleas whenever necessary. If you have any questions about any of the guidelines we have listed here or about how to use specific medications with your pet, then please discuss those with your veterinarian. That is the safest way to ensure that you are treating your pets properly. Very good information and a great hub. Good luck with your Pets! Nicely collected information. Thank you very much for writing a great blog post. I agree with all of the above-mentioned points and safety tips for cats.